Buy YellowMenace a Coffee. ko-fi.com/yellowmenace - Ko-fi ❤️ Where creators get paid by fans, with a 'Buy Me a Coffee' button. The Slanted Eye on Asian Art since 2013, curating Asian themed art collections & bringing you the best pop, anime, graffiti, geek, toy & fan art from upcoming & established Asian artists, as well as artists inspired by Asian culture. Secured Payments. Support goes to YellowMenace's account. 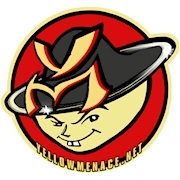 Upgrade YellowMenace to a yearly Gold Membership with a one-time payment.